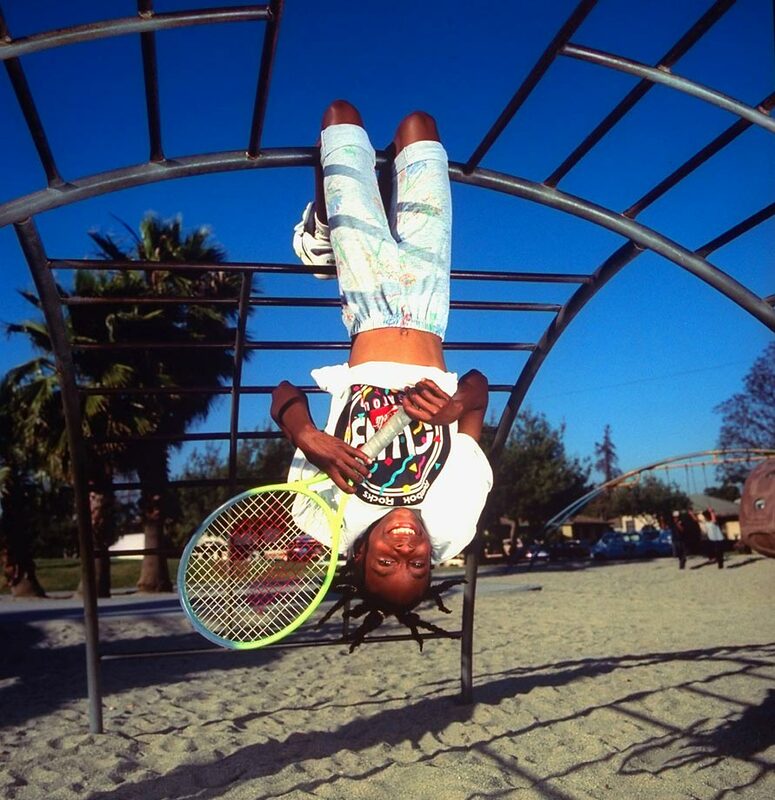 A 10-year-old Williams lies in a pile of tennis balls in Compton, Calif. Soon after this photo was taken, the Williams family moved from Compton to West Palm Beach so Venus and Serena could attend Rick Macci's tennis academy. 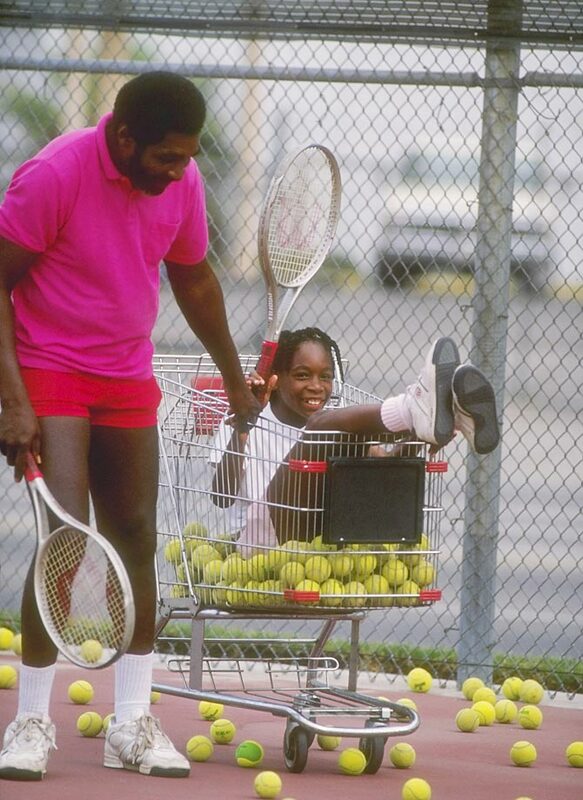 Williams is pushed in a shopping cart by her father, Richard Williams, during practice. Richard promised coach Rick Macci that Williams was the next Jennifer Capriati, but Macci didn't believe Richard. 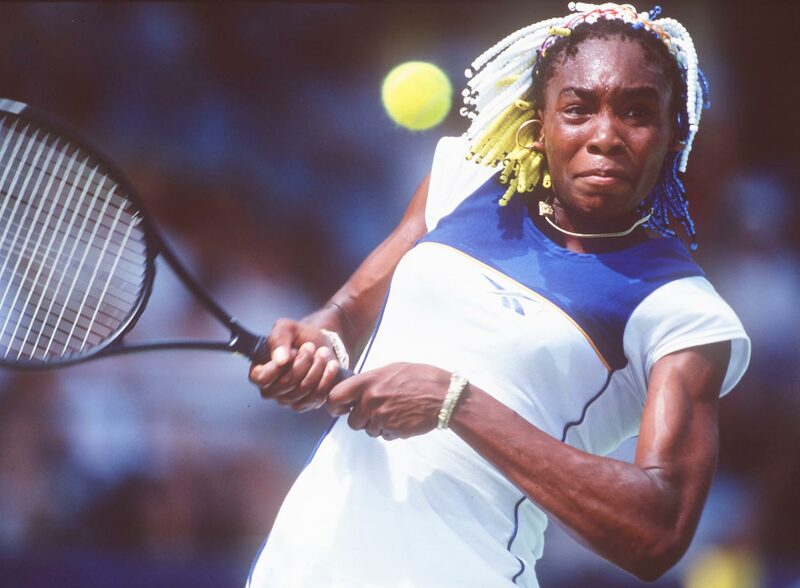 It wasn't Williams' tennis ability that originally impressed Macci, it was her athleticism—she walked 10 yards on her hands and did backward cartwheels, leading him to feel that he had a "female Michael Jordan on [his] hands." 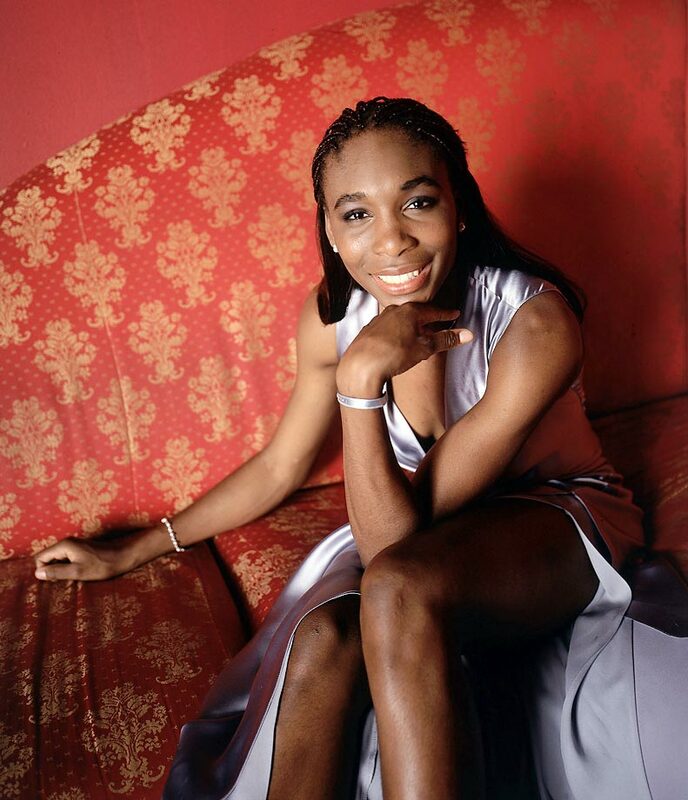 Williams made her debut on the sports scene in a Sports Illustrated article that dubbed her "tennis's newest pixie." In the story, Williams said she wanted to grow up to be an astronaut. And some of the people interviewed in the story correctly predicted her future as a Grand Slam title winner. 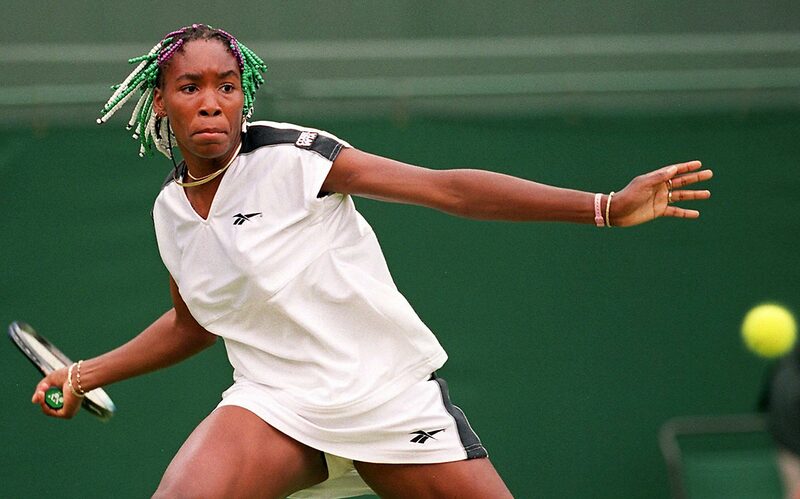 With her hair beaded in the Wimbledon colors, Williams returns a forehand in her first-round match at the Wimbledon Championships. It was her first trip to the All England Club, but she lost the match to Magdalena Grzybowska, 6-4, 2-6, 4-6. Williams hits a backhand during the Adidas International event in Sydney, Australia. Her beaded hair would spark a fashion phenomenon. Williams takes a break during her second-round match with Belarus' Natasha Zvereva at the French Open. 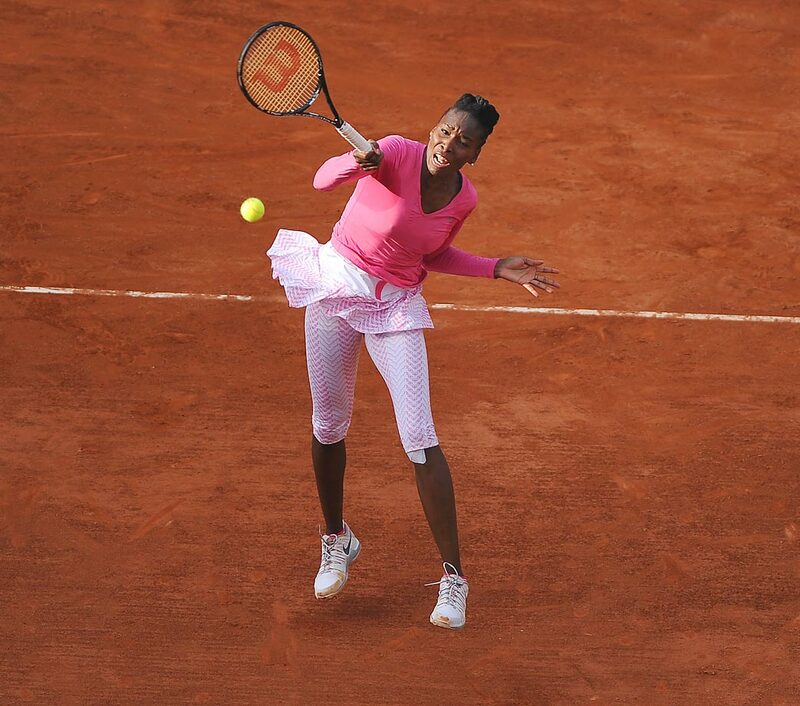 Williams won the match 7-6, 6-0 but lost in the quarterfinals at Roland Garros. But she took home a trophy anyway, as she and her sister won their first Grand Slam doubles title, beating Martina Hingis and Anna Kournikova in the final. 7 of 36 Walter Iooss Jr.
Williams has been interested in fashion and design since she was a teenager. She decided to attend the Art Institute of Fort Lauderdale and graduated with a degree in fashion in 2007. That same year, she teamed with retailer Steve & Barry's to launch a clothing line called EleVen, which she wears on the courts. 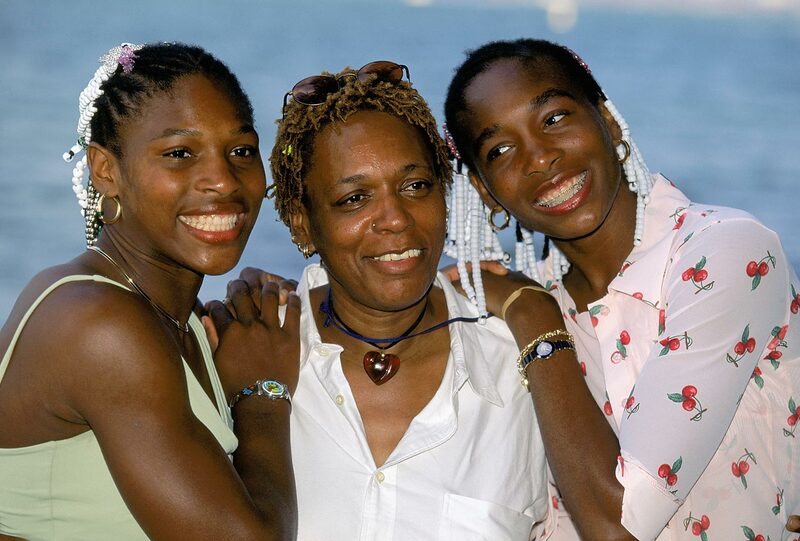 Both Venus and Serena have said their mother, Oracene Price, has played a huge role in shaping them. 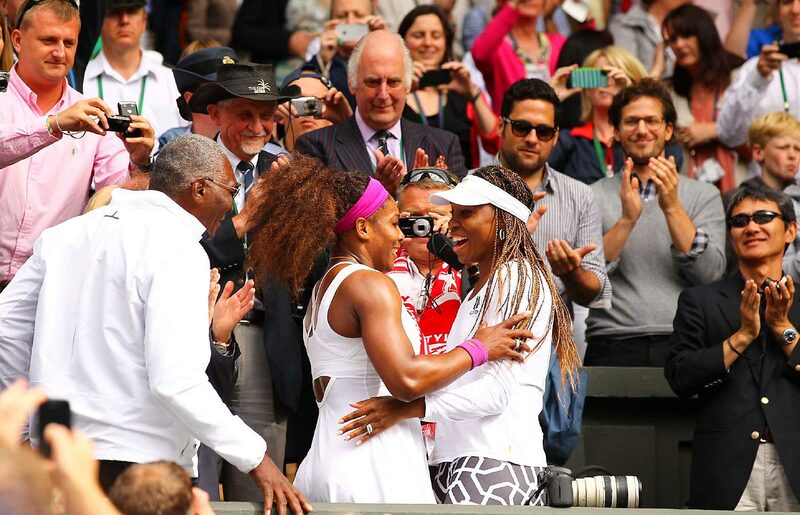 "It’s almost like they were raised on the court," Price has said of her two daughters with Richard Williams. 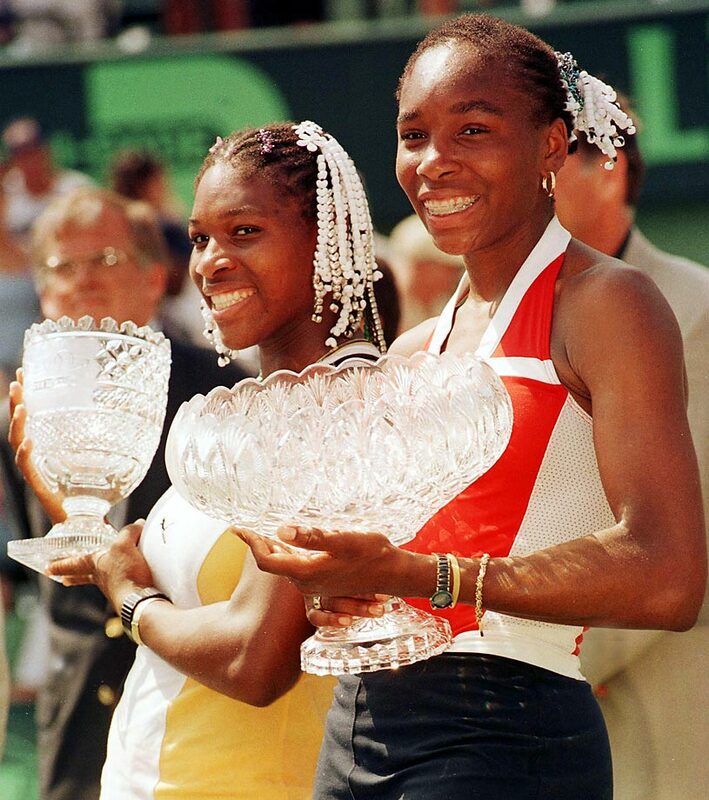 Venus and Serena hold up their trophies after the finals of the Lipton Tennis Championships. 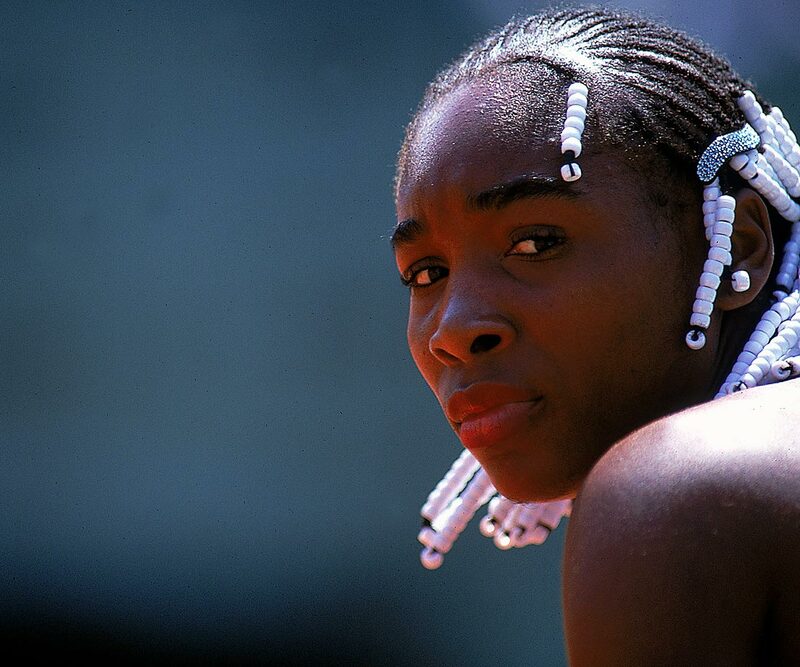 Venus defeated her sister in the finals, 6–1, 4–6, 6–4. It was her third title of the year and 10th of her career. The two sisters have met in 12 Grand Slam tournaments—Venus has won five of those matchups—and have met up in the finals eight times. Their current head-to-head is in Serena's favor, 14-11. 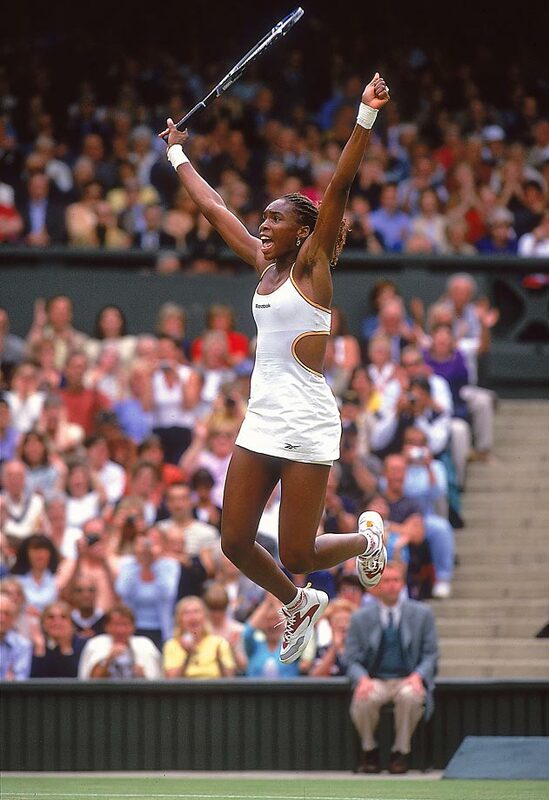 Williams celebrates winning the Wimbledon women's singles title. She beat Lindsay Davenport 6-3, 7-6 (3) for the first Grand Slam title of her career. She has had most of her success at Wimbledon, where she has won five titles, including back-to-back titles in 2000 and 2001 as well as in 2007 and 2008. 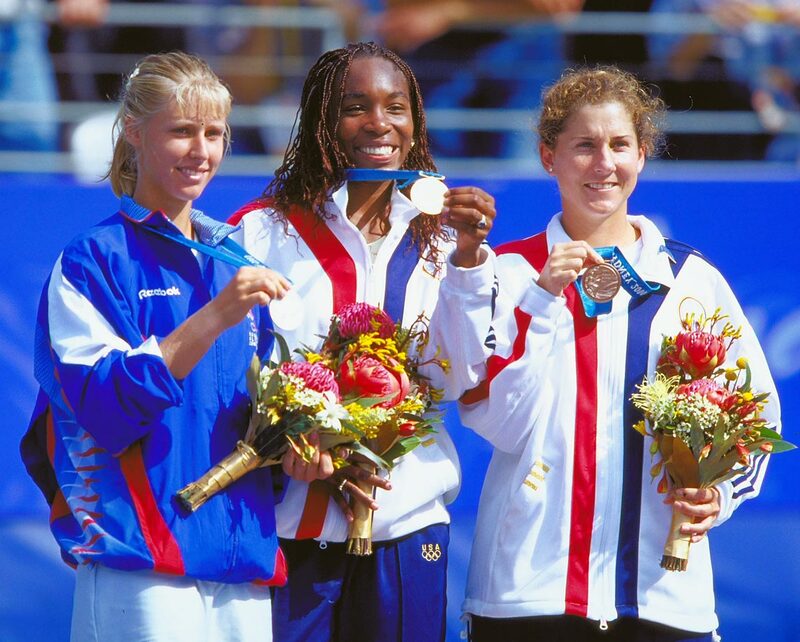 Williams holds up her gold medal at the Sydney Olympics with silver medalist Elena Dementieva, whom she beat 6-2, 6-4, and bronze medalist Monica Seles. Williams took home another gold medal as part of the winning doubles team with Serena. Williams holds up a trophy at Sport Illustrated's Sportsman of the Year celebration after winning the singles and doubles titles at Wimbledon, the singles title at the U.S. Open and two gold medals in singles and doubles play. She finished the year ranked No. 3 and at one point during the season had a 35 consecutive match win streak. 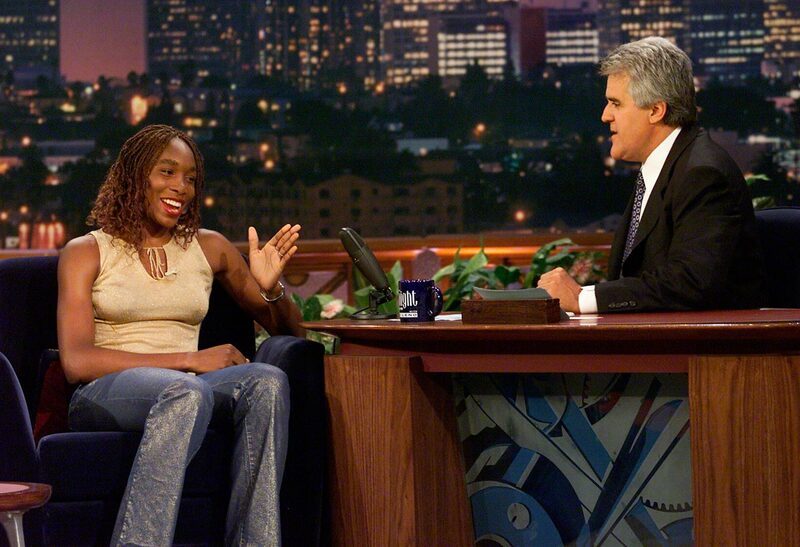 Williams appears on the Tonight Show with Jay Leno. Williams has been a guest on several different TV shows, including Sesame Street, Punk'd and a number of talk shows. Williams celebrates becoming the women's singles World No. 1 in February. 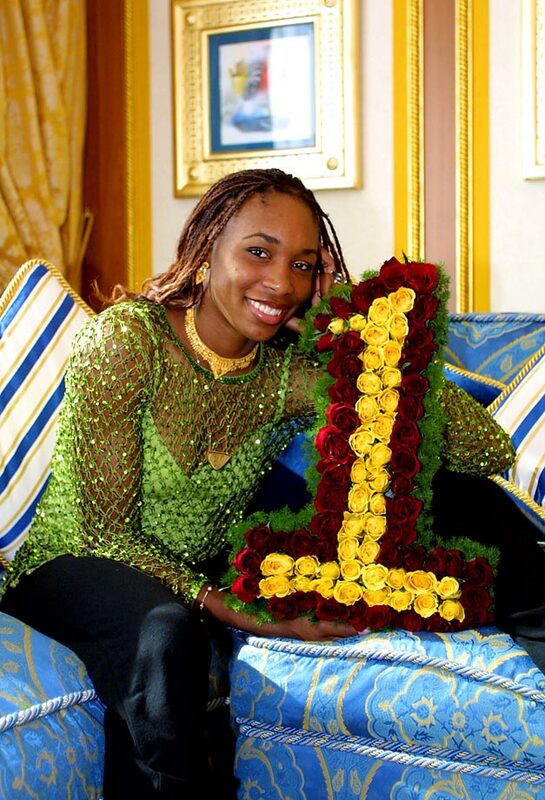 Throughout her career, Williams has only spent 11 weeks as the top-ranked player. Williams said she decided to pose for the 2005 SI Swimsuit Edition after her sister posed for the magazine in 2003 and 2004. In the same year she posed for the SI Swimsuit Edition, Williams was also awarded Glamour Magazine's Woman of the Year Award. 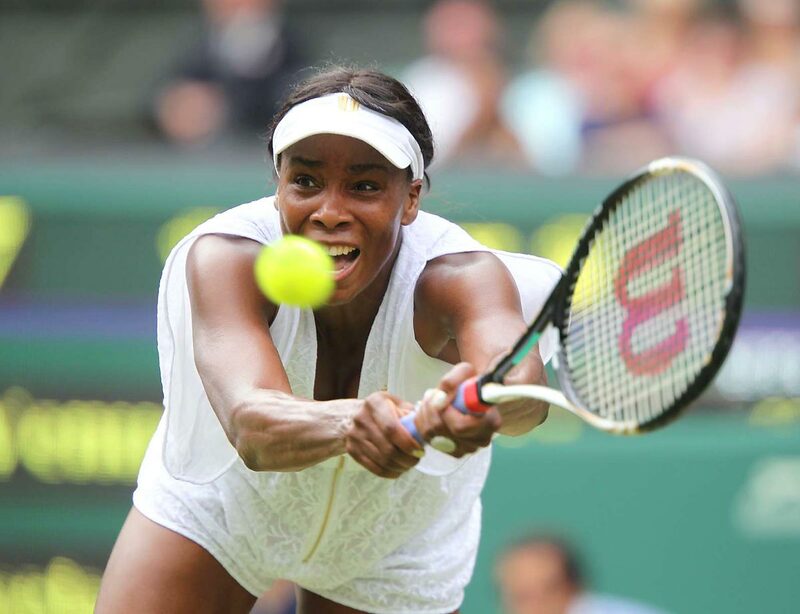 The defending Wimbledon champion, Williams breezed through her first-round match at the All England Club in 2006, only dropping one game, but she lost in the third round to 26th seed Jelena Jankovic. Williams suffered from an injured wrist in that match and re-aggravated it later in the season, finishing as world No. 46, her lowest ranking since 1997. 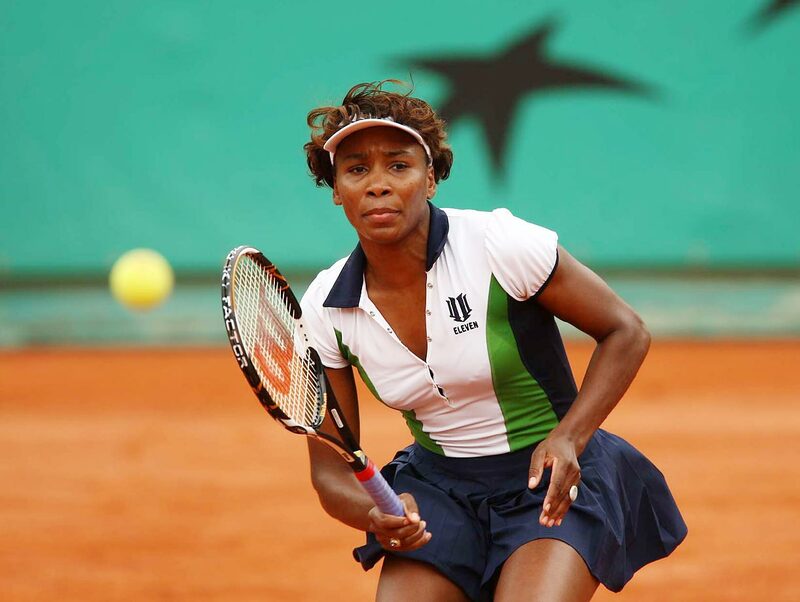 Bouncing back from a rough 2006 season, Williams made it to the third round of the French Open, where she lost to Jelena Jankovic for the third-straight time. 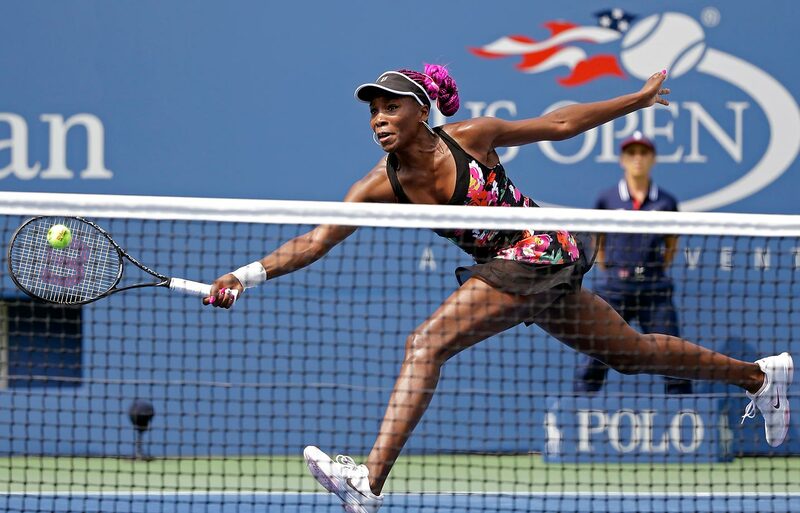 In the tournament, Williams hit a 128 mph serve, then the fastest woman's serve ever recorded during a main draw match. William lays out to return a point to Maria Sharapova in the fourth round at Wimbledon. Williams beat Sharapova 6-1, 6-3 to advance to the next round. 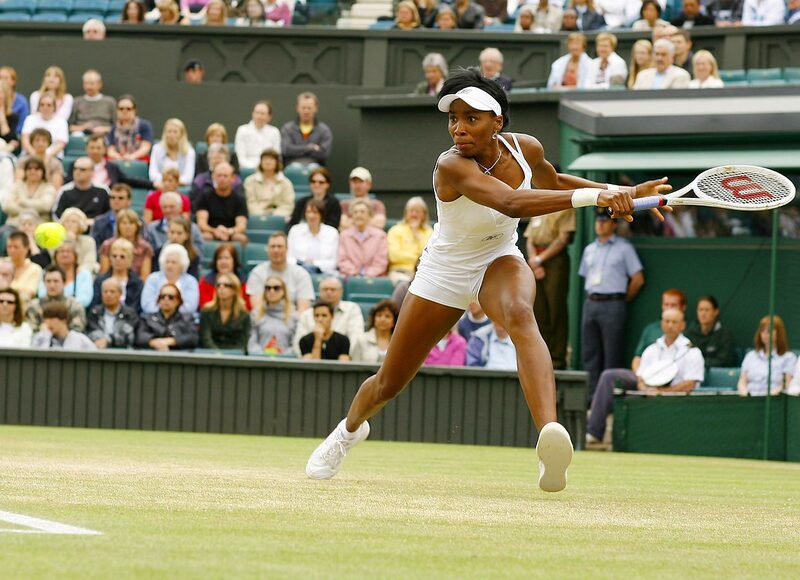 Williams returns a forehand to Svetlana Kuznetsova in a Wimbledon quarterfinal match, which Williams won 6-3, 6-4. Despite being a No. 23 seed, Williams would go on to capture the singles title for her sixth Grand Slam title and fourth win at the All England Club. Williams, the 2007 Wimbledon women's singles champion, poses with Roger Federer, the 2007 Wimbledon men's singles champion, at the Champions' Dinner. Williams suffered a disappointing, early defeat at Roland Garros in 2008, within 24 hours of when her sister was also knocked out. Clay is Williams' weakest surface, and she has only made it to the finals of the French Open once, where she lost to her sister. Williams stretches to return a point against Tamarine Tanasugarn, whom Williams beat in straight sets to advance to the Wimbledon semis. Never dropping a set, she would go on to beat her sister in the finals, 7-5, 6-4. 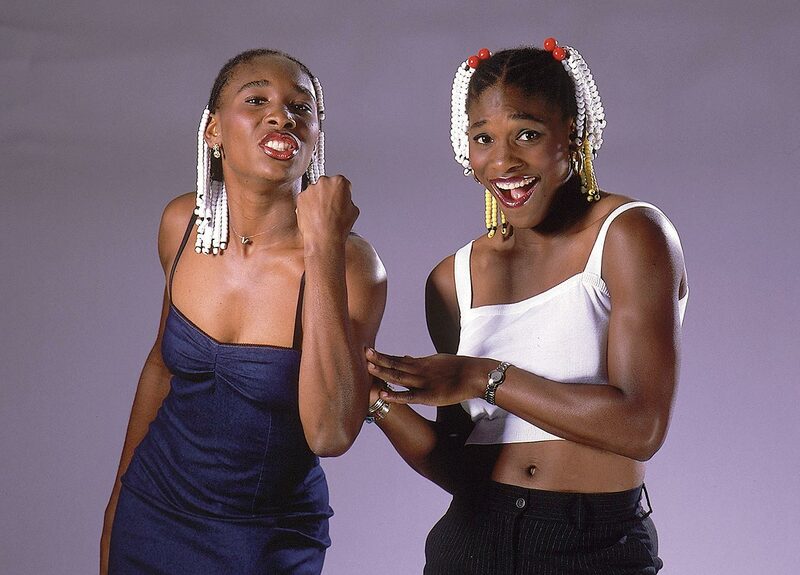 The two sisters hadn't played each other in a Grand Slam final since 2003, and Venus hadn't won since 2001. Williams took on Kim Clijsters in the semifinals of the 2010 U.S. Open, but Williams lost. And, after the tournament, a left knee injury made her sit out the rest of the year. Still, she joined Caroline Wozniacki as the only two women to reach at least the fourth round of all the Grand Slam tournaments. In a season marked by injuries and illness, Williams returned to Wimbledon in 2011 and advanced to the fourth round—her second round match went nearly three hours—but couldn't make it past Marion Bartoli. 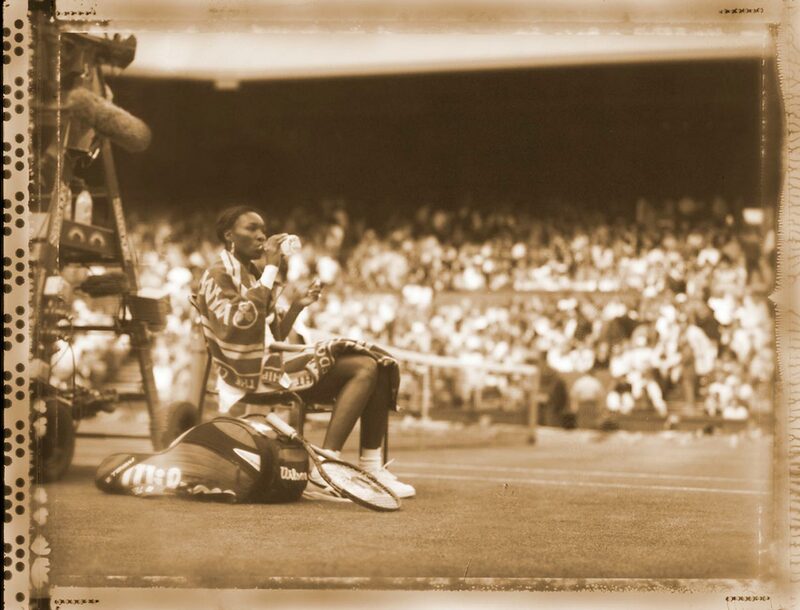 Despite the number of tough matches the two have played, Venus and Serena have always supported each other at matches, like here, when Venus watched her sister win her 14th Wimbledon title after Venus lost in the first round. 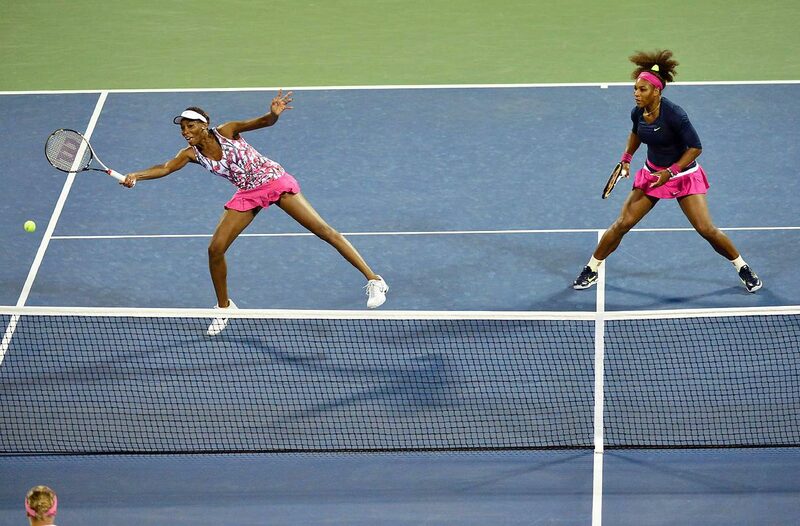 The Williams sisters have both spent time as the top-ranked women's singles players. At one point they held the No. 1 and No. 2 spots and were the No. 1 women's doubles team. 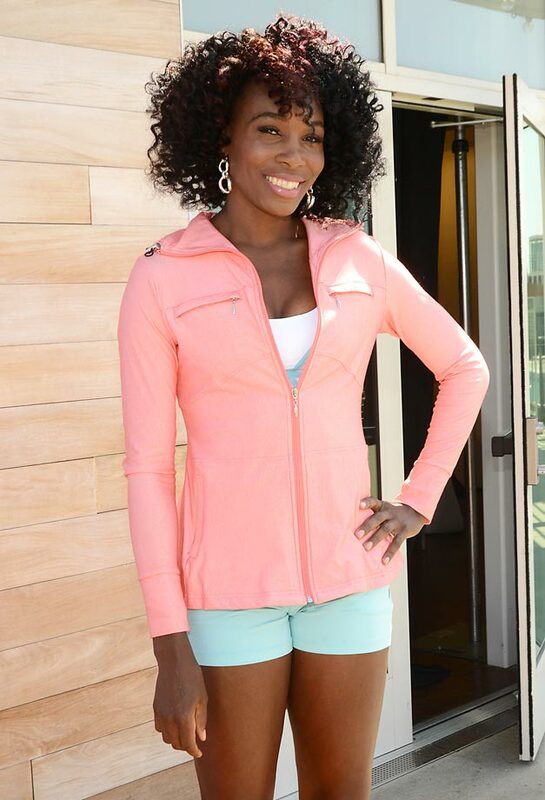 After being diagnosed with Sjögren's syndrome, an autoimmune condition, in 2011, Williams adopted a vegan diet. She tries to avoid all sugars, so she mainly eats a lot of vegetables and makes several kinds of green juices. 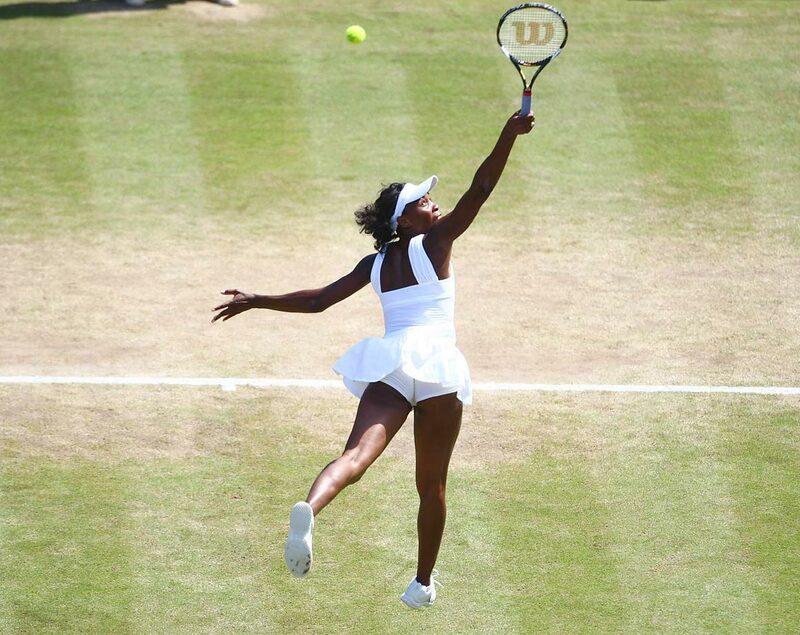 Williams plays a very attacking game, complemented by an absolute devastating serve—she holds the fastest serve at the French Open, Wimbledon and the U.S. Open. She is primarily a baseline player but can show off her volleying skills and great court coverage. 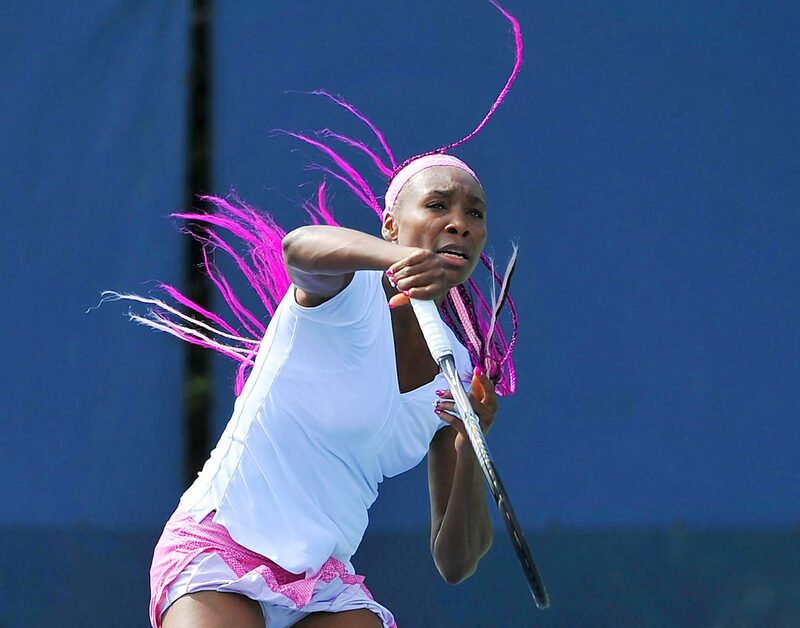 Williams' purple braids, which were on display during a practice round in 2013, caused a stir at the U.S. Open. In tournament play, she also debuted a number of other accessories, including rhinestones on her wrist, a small bow on her fourth fingernail and a giant ring on that same finger. 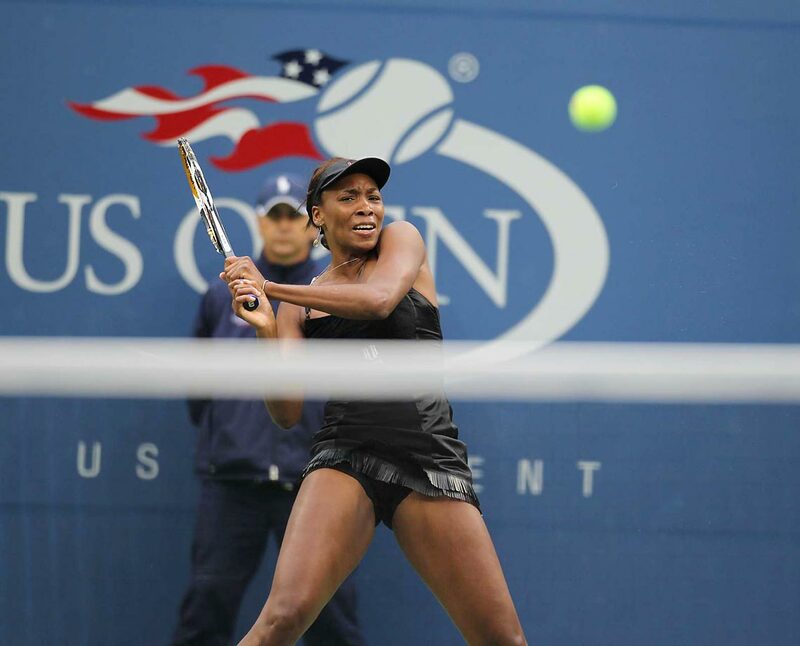 Williams returns a shot to 12th seed Kirsten Flipkens at the U.S. Open. Williams, who was still suffering from different injuries, pulled out the huge upset over Flipkens. Williams has been a huge proponent of equal tournament prize money for men and women, eventually putting enough pressure on the situation that in 2007, both Wimbledon and the French Open agreed to pay men and women equally. Williams won Wimbledon that year. 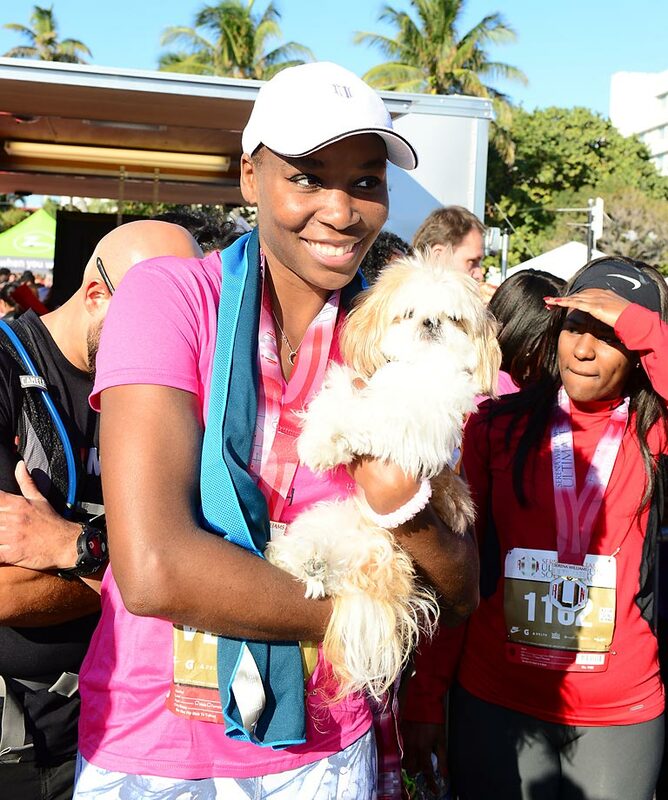 Williams, here participating in the Serena Williams Ultimate Run in Miami Beach, Fla., is a part-owner of the Miami Dolphins along with her sister. They became the first female African American owners in the NFL. 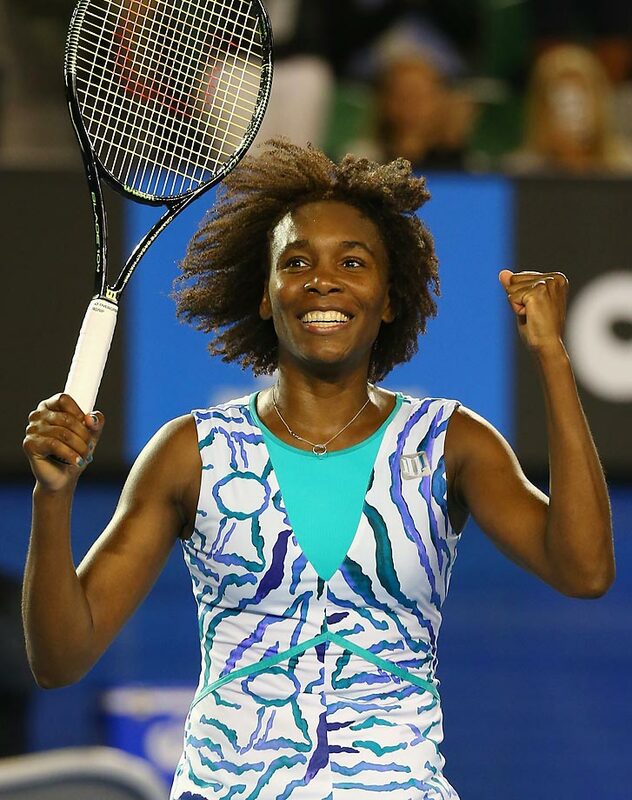 Williams celebrates beating Agnieszka Radwanska 6-3, 2-6, 6-1 in the fourth round of the 2015 Australian Open. While Williams then lost in the quarterfinals, it was her best finish in years. Venus and Serena Williams attend the Sports Illustrated Sportsperson of the Year Ceremony for Serena at Pier 60 in New York City.